Unfortunately we had to hold Friday Night Kruzn a week early in May, but that didn’t keep you from coming out. We ended up with almost 60 cars in the Village. That made for a great night, with some awesome cars, and some great friends. 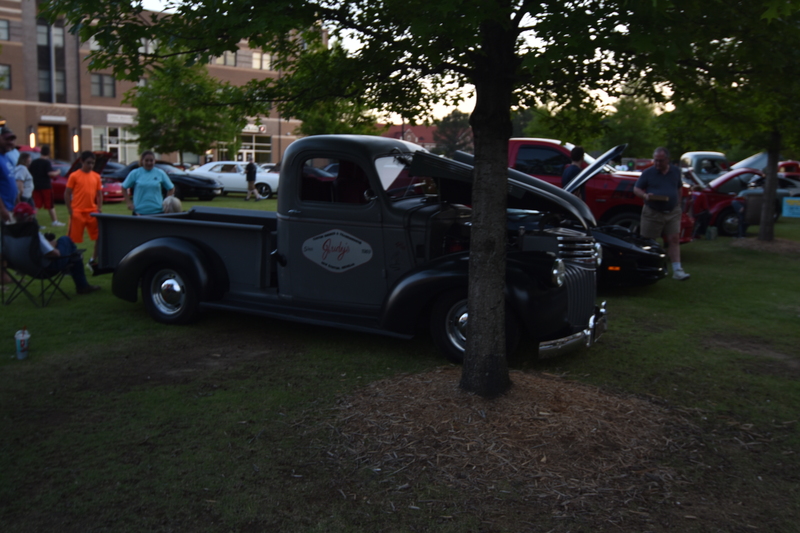 Here are some pictures from May’s Friday Night Kruzn! 2016 is here and I hope each of you have a wonderful time through the holidays and was able to spend some quality time with your family and friends. 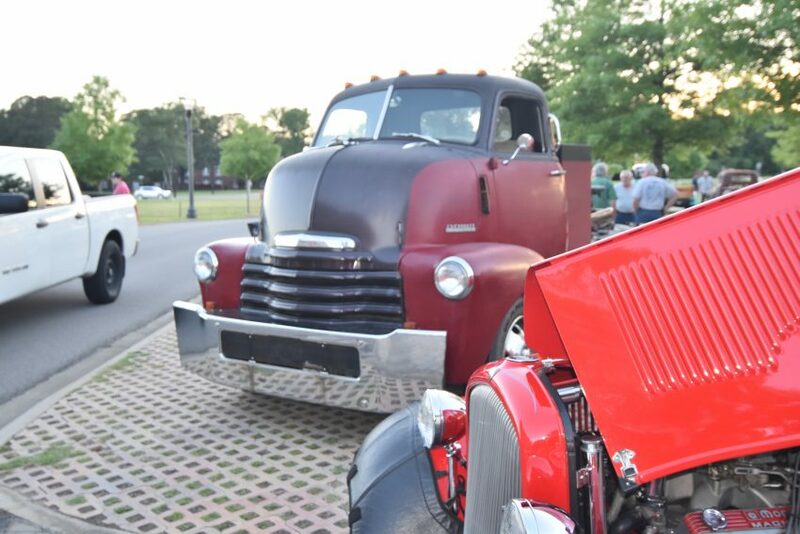 Now it’s time to gear up for the 2016 car show and cruise night season. At StillKruzn, we have already started talking about Friday Night Kruzn and looking forward to kicking it off on March 18, 2016 at the Village at Hendrix. 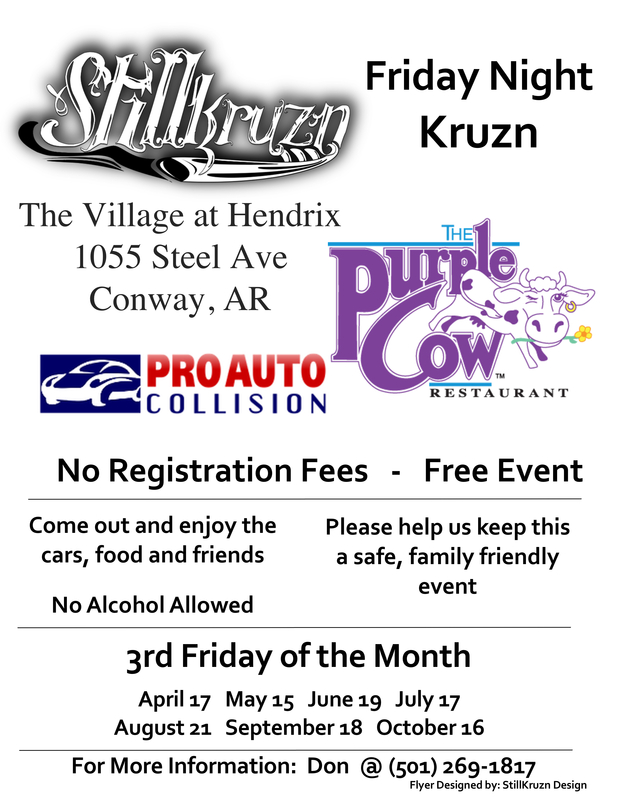 This year, Friday Night Kruzn is being presented by StillKruzn, Pro Auto Collision and Preston Palmer Studios, and sponsored by the Purple Cow – Conway and ZaZa’s. Just a little history on this little event. It started in October of 2014, I hosted the first event just to test the waters to see if this was even going to fly. It seemed to have a positive response, so in 2015 we started it as a monthly cruise night with sponsorships from Pro Auto Collision and the Purple Cow. Later in the year ZaZa’s and Preston Palmer Studios also came on board. The first night in March of 2015, we have about 20 cars show up. 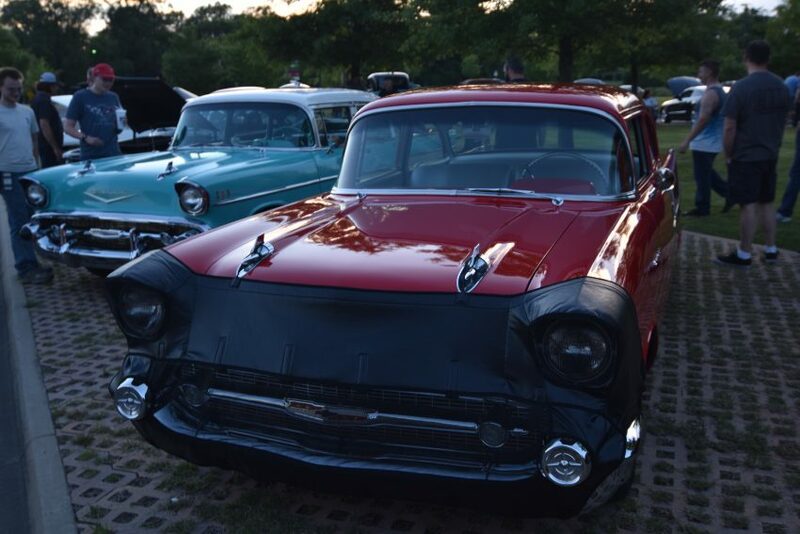 In October 2015, we had almost 80 cars in attendance and many spectators. We are the only cruise night that I know of in Arkansas that has live music. We try to offer things that make us a unique cruise night to stand apart from the others. The atmosphere of Friday Night Kruzn feels like an old town square, and that is what makes it so cool for me. Just a gathering of friends, a time of fellowship, and that is what it is all about. I keep saying, that it’s not about the awards, or even the cars (although it is about the cars a little bit), it is about the people, the friends you make over time. That’s about it…. so we are hoping you will come out and join us for Friday Night Kruzn this year. I am not sure how we will top last years events, but we will do everything that can to do it! Hope to see you out there! Another Friday Night Kruzn Post! As you may have seen on our Facebook page, we have decided to make Friday Night Kruzn a monthly event. 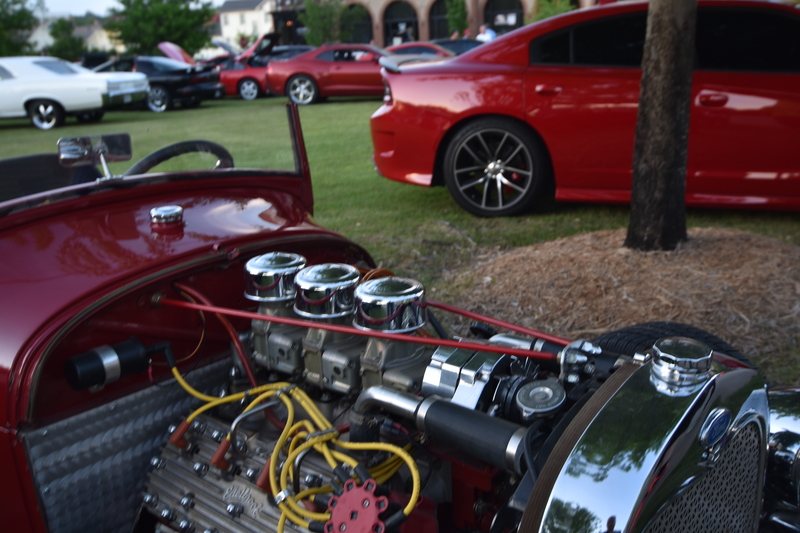 The first event was successful as we had about 35 cars show up and quite a few spectators. All the sponsors were very pleased with the turnout and looking forward to the next one. The Purple Cow will still be offering the 10% off your bill, so be sure to get a coupon from a Friday Night Kruzn staff person. We are going to hold this event on the 3rd Friday of each month through October, weather permitting. All announcements will be made on the StillKruzn FB page.